Looks like there is a bit of tidying up going on with the Swans at Companies House. Interestingly, the latest change focuses on Dineen. a penny for Mal Pope's thoughts right now! Mark, not fully au fait with this. Can you explain the family tree of this business & it's relationship with the Swans over the years. Was it formed when the film was made etc. Does it have any relationship with Bay Studios. Lot more detail on this on Planet Swans(Apologies but I never figured out links). In depth looking at the JTK Account,s it details loans from the Club to finance the DVD and the income from it? some info on the company and its current debt to the Swans. To finance the production of the film FAJK Swansea City FC have made unsecured interest free advances to the company of £1.2M of which £1,161,150 remains outstanding on the 28th February 2015.The directors are confident that future sales will be sufficient to enable the company to meet its liabilities as they fall due.. Future profits will be allocated to repayment of the outstanding advances. The directors of Swansea City FC have agreed that repayments will be limited to future profits from the sale of the film rights of from FAJK . How much more income is likely to be received from the sale of the film rights ? Probably very little. If that is the case then the loan from the club will never be repaid. Another sound investment made under HJ's leadership. Someone more cynical than myself might suggest that the film was made to promote the club prior to selling, and we all know who profited from that ! This company is not listed as a subsidiary of the club parent company - it stands alone - so it's a bit strange that Pearlman is getting involved with it, even if LD is resigning his directorship in it, and especially as its finances look very flimsy. Strange one that. What is the point of Pearlman’s appointment? Will they be reissuing the film with unseen footage I wonder? 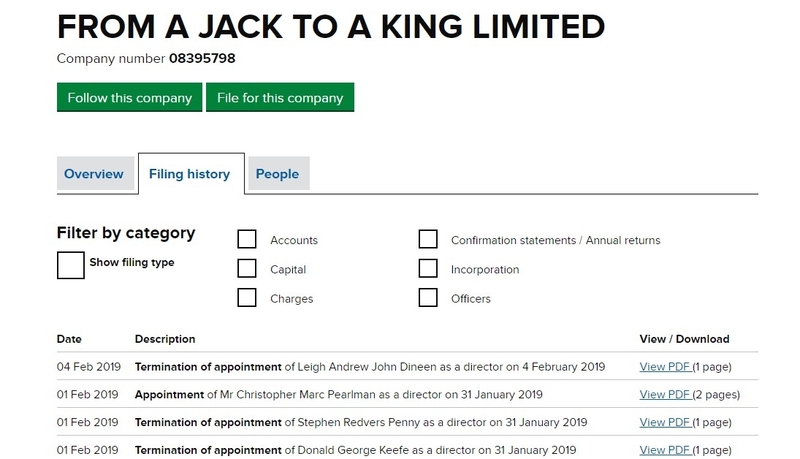 It’s a bit odd that Mr Penny and Mr Keefe we’re still named directors as well . Maybe the yanks are writing the debt off as a loss ?? We have been over this many times in the past. The film was made by a respected documentary-maker who would not have agreed to participate if it had been a piece of marketing fluff. The club got involved when they realised there was an opportunity to market the SCFC brand in other territories via the film, and so loaned money to the production to ensure that they were able to print enough DVDs to sell around the world. But they didn't sell enough DVD's did they ? This culminated in a huge loss to the club but the story it told helped certain individuals to make a small fortune. Meanwhile the club sits on a near £1m bad debt. A new film showing Jenkins and Morgan, Kaplan and Levien doing the same behind closed doors would sell well in America and the UK, we all like a good plot, Riches to Rags with The Eagle landing on the Swan and eating it up. Maybe it should have sold a bundle, but it didn't. That's a risk that anyone who invests in film making takes. However, unless for the reasons stated, why would a football club risk such a large sum of money ? You are most probably right about the wrong director to hone on film one of the most dramatic and inspiring footballing stories ever told. It didn’t get to the beating heart of the story for me and the commercial it is now regarded as airbrushes out significant characters that played their part in the rise of the club in equal measures with those that were featured in the film. Maybe there is scope for another film that also includes the controversial sale of the club to the current American owners. A community and fan base betrayed by their own would make for interesting viewing. Not sure what it would be called. Something that would encapsulate the rise and fall that possibly gives a nod to the Jack to a King film title perhaps? “By the Fans for the Fans” perhaps? It would probably need the court case to go ahead so as to provide the necessary info with which to incorporate into the documentary. had a look at all the accounts, debts, shareholdings, liabilities etc, don't see any revenue, surely the ticket sales and DVD's sold would have covered a mere 1M, nearly everyone I know either watched the film or bought the video. Is this another issue of no breakdowns or failure to disclose. Perhaps some of the profit made from the film can be gleaned from the meagre amount paid back to the Swans. Well I bought the DVD, lent it to a friend about 2 years ago and haven't bothered to ask for it back. Contrary to other posters above, I actually thought it was well made and, had it not been for the circumstances around the sale, I'm sure we'd all feel differently about it. The filming of the convoy coaches on the M4 gives me goosepimples right now...…..
Jac - I don't know how you know they were from a bubble trip but that's taken the magic away for me now - artistic licence hits a new low. So it was a sh1t film after all. They do it all the time by the looks of it. Bohemian Rhapsody is a good example of this whereby they rearranged the timeline of a live performance of Queen to suit the story of Freddie Mercury as mythologised by the movie. These moments in films once known certainly spoil the enjoyment of them. I for one felt cheated with both films. Not being completely up to speed with the rise of the Swans from the get go I must admit that I was oblivious initially of the omissions. Until, that was, I noticed that the Sousa era was conspicuous by its absence. Clearly the fairytale had plateaued during that season and therefore Sousa’s spell at the helm didn’t lend itself to the relentless seamless rise through the leagues that the director wanted to evoke. Cue the airbrushing of this moment in the story of the rise and rise of SCFC. Through reading various posts during the time of the films release I’ve since discovered this was not a one off occurrence within the narrative of the film. So much so you have to ask yourself was it an excercise in promoting certain key figures as the ultimate saviours of the club? As an advertisement it works perfectly well. As a true grit document of what actually took place it leaves a lot to be desired. Good points SJ, I blame the director not being a football fan, he should have been told that creative licence won’t wash with those that were there, and for me, the real story was far better than the one told, kenny and Paulo airbrushed out and the supporters trust made out to have had little to do with the remarkable story, and it was a remarkable story, warts and all. Bit purist if you ask me. You and I might pay to watch a six-hour documentary which told the story of the Swans in achingly specific detail, but documentary makers these days need to entertain as well as educate. Have you seen ‘Searching for Sugarman’? That’s one of the best documentaries I’ve seen in recent years. Takes total liberties with the facts but the essential story is true. ‘The Imposter’ uses actors to recreate events because there’s bog all original footage to use. ‘Making a Murderer’ has been slated for what it left out. By comparison, ‘Jack to a King’ is a minor offender for leaving out the most exciting 1-0 wins from Sousa’s reign or Kenny Jackett’s contribution to our rise from the ashes. No footage of coaches heading to Wembley so they showed coaches heading to Cardiff instead? F@ck me that’s hardly a hanging offence!!! I wouldn’t claim it’s perfect (I wouldn’t even put it in my top 20 favourite documentaries of the past few years and I’m Swans obsessed) but to call it a sh1t film is a bit over the top (unless it was a joke)? Cadleigh mun, come on, you should know me by now. If I'd had a "tongue in cheek" emoji I would have used it twice. Your hanging offence comment though, mmmm, let me think about that ………. Not saying it was a crap film. And I suppose that’s how you approach it watching it as a Swans fan, which is to treat it as a movie to enjoy rather than a documentary to watch (not easy to do however going by the posts I’ve read). The IMDB rating is high on their site but it’s still only showing 232 reviews, a number normally designated for cult films. Clearly the film didn’t reach out to its intended audience as successfully as I’m sure was hoped. It looks as though globally it didn’t cause a stir and amongst the fans it’s become a byword for the treacherous sellouts. So what was supposed to be all things to all the paying public simply ended up sitting awkwardly between two stools. The shots of the convoy of buses not being the actual footage of the those driving to Wembley does become a problem (albeit not a hanging offence). It calls into question the rest of the film and what it means to the viewer watching it (BTW I can’t say for sure whether this footage is of a Cardiff tour to their stadium. The poster who stated this would need to explain how they have come to know this). Other alterations and omissions are more problematic than this however. The main one that everyone seems to question is the absence of Mel Nurse, a pivotal figure who was just as instrumental as Huw Jenkins et al. The magic cash point machine is also laughable and this is where the truth would have been a more appropriate telling of the story and more interesting for that matter. So, it’s safe to assume that the story of the Swans’ rags to riches rise through the leagues is still largely untold and waiting to get out there. Safe to say that there is scope for a Lord of the Rings type trilogy now what with the sale of the club and then the fallout of the sale. It would need to end on a high note however with a win in court for the Trust with the proceeds going towards owning the club outright. Movie titles that I can think of is “Jack to a King - Revisited” would be the overarching title, then for the trilogies themselves it would be “The Fellowship of the Jacks”, “The Two Owners”, and finally “The Return of The Swans”.